The opening scene at beautiful St. Louis University High School which has a portion of the city landscape as a backdrop was a mixture of early summer putrid humidity and the sweet sense of summer breeze. Things really got started after a flurry of introductory races led by girls and boys Spewak Training Elite Developmental Miles winners Sarah Murrow (So., St. James Academy KS) 5:06.83 and Camren Fischer (Jr., Fayetteville AR) 4:13.03. Logan Hall of Arthur took second with a three-second PR in 4:16.06. Charlie Parrish of Freeburg also competed running 4:23.14. Next on the menu was the appetizing High School Girls 800m which serves as a break for the flurry of mile races. Colorado overall state champion Marlena Preigh ventured east to get in a fast time. The Fairview junior had previously competed here a year ago and placed 4th in the mile. This time, though, she wanted to better her personal best 2:09.19. For awhile the goal appeared out of reach as Ally Ryan of Jenks, OK led off of a solid pace for much of the way. It wasn't until the home straight that Preigh came alive and overtook Ryan for the personal best US #2 2:07.56 victory... Illinois 2A champion senior Rachel Hickey of Lasalle-Peru took third in a personal best and IL#2 2:10.09. Neuqua Valley junior Mikenna Robinson took fourth in 2:12.63. The boys 800 championship section brought a little bit more hype because of the wonder kid and local fave Brandon Miller of John Burroughs HS. The sophomore sensation got a late start to the track and field season because of basketball as well as he plans on racing late into the summer. Miller is well acquainted with competing in FOM. As a youth, he broke several athletes as well as peers on the SLUH oval. Miller recently broke a 31 year old Missouri all-time 800 state meet record running 1:49.55. He simply wanted to dazzle his crowd before heading off to the Brooks PR Meet next weekend in Seattle. The pacesetter was brought in to go 53 seconds for the opening lap. Unfortunately, Miller had to share duties which appeared to alter his overall mood and where he needed to at certain checkpoints. The final verdict was an easy money victory in a meet record 1:50.03... Thomas Shilgalis of Naperville Central continues to impress with his feet. After already having an outstanding junior campaign in the 1600, he took one more crack in the half-mile and dropped a BIG state-leading 1:51.81 to finish in second. All-stater junior Grant Jensen of Prairie Ridge also got a personal best taking third in 1:53.10. The featured championship girls mile race did not have any Illinois girls in the field, but it does not mean it was not to be overlooked. Missouri big school 1600 champion Tori Findley of Blue Springs got off to a fast start and burning the field as she hit the first half in 2:20. As she slowed on the next circuit a herd of girls began to close in her. Sticking to her race plan, Findley was able to hold on strong and win in a personal best 4:49.35. Two New Yorkers so eager to run in the FOM boy championship that they almost forgot to pick up their racing bibs upon entering the stadium. Senior Mason Gatewood of St. Anthony's, in particular, had a personal stake in the race. His father is a graduate of SLUH and he has family in the area who came out to support him. The race went out as expected in under 2:05. Gatewood and his teammate junior Matthew Payamps closed out the final lap in fine fashion, overtaking bandit Andrew O'Keefe of O'Fallon, and lacing themselves with personal bests 4:07.00 and 4:08.32. They now head to their state meets as bullseye targets next weekend and then on to New Balance Outdoor Nationals thereafter... Wyatt McIntyre of Athens closed out a fine career in 11th place (4:20.61) and Sam Rivera of Chicago Whitney Young was in the caboose with a time of 4:21.76. What would a championship meet be like without professional runners? The Women's 800 race was a thriller as Lindsey Butterworth representing New Balance Running Club led a strong field in 2:01.13. She had to come from behind the first lap to overtake earlier leader Kendra Chambers of Oiselle. 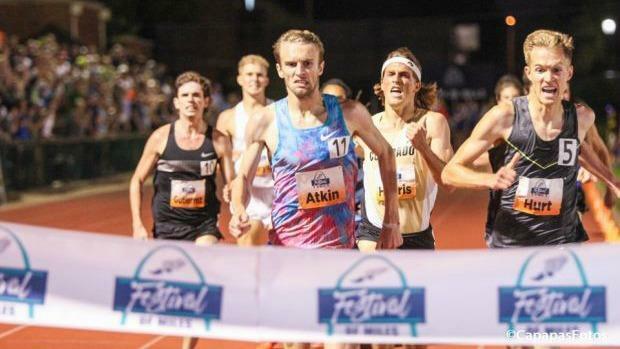 It did not appear as though we would see a sub 4:00 mile with the 3/4 mile in 3:01. The beehive like pack of 9 guys got to work and churned out a final circuit in 56-secs. The winner Tripp Hurt formerly of Furman University led six others under 4:00 with a personal best 3:58.54.